The first Lumber Shed restaurant is officially open and already the space is seeing crowds. Osteria Morini brings upscale, Italian dining to the neighborhood, not far from a few other neighborhood favorites. I know many of you feel strongly about your local Italian options, as evidenced by the comments on a review from one of our oldest Italian restaurants. As the website explains, Osteria Morini is named after Chef Michael White’s mentor Gianluigi Morini, the owner and founder of acclaimed restaurant San Domenico in Imola. The restaurant draws strongly from White’s personal experience in Emilia-Romagna, where he worked under Chef Valentino Marcattilii for seven years. And in Italian, “osteria” means a place where the owner “hosts” guests. Osteria Morini approaches its menu in a way that encourage guests to order a little bit of everything by offering an array of small plates. I personally love that approach over a massive bowl of pasta that leaves me feeling stuffed at the end of my meal. Our table of three ordered about 12 plates and each had different favorites. Mine was the truffled ricotta ravioli, but I’m also a sucker for ricotta and truffles. Other favorites at the table were the shrimp and sepia ragu and the crispy pig’s head terrine. As for prices, this place gives Acqua al 2 a run for its money. This will be a delicious meal but not a cheap one. 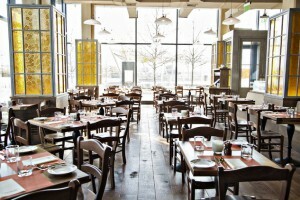 The tables are also packed in very tight, and the high ceilings and large windows make for a very loud atmosphere. If you prefer a quiet restaurant, you should plan to go early or on a weeknight when they might not be as crowded. While the prices mean this will not be a regular dinner spot for me, I am glad to see it open. The large windows cast a beautifully inviting glow into Yards Park, and it gives me hope that the neighborhood will continue to grow into a new destination. The night we went there for dinner, the streets around Yards Park and the Boilermaker Shops and Bluejacket were pack with people coming out for dinner, drinks, and the art show to kick off Art Yards. I have been eyeing the Lumber Shed at Yards Park for years, dreaming of what exciting things could be coming once it was fixed up. Having watched the neighborhood take shape over the last 10 years, I couldn’t be more excited for the progress made and how much more is to come. Osteria Morini is located at 301 Water Street SE. Please note that some online maps are not marking this location properly. Google Maps has been updated so that’s your best bet if you are not familiar with the neighborhood. We checked the place out last Wednesday and had a good time. Wasn’t that loud at all, but the background music was the Greatest Hits of the ’70s: Steve Miller Band, Stones, Creedence. I suppose they’re going for a Boomer demographic, but it just seemed. odd. I particularly enjoyed the lardo and the fresh pasta. Without wine, our bill sneaked in just under $100, which for two, isn’t that bad for downtown prices.